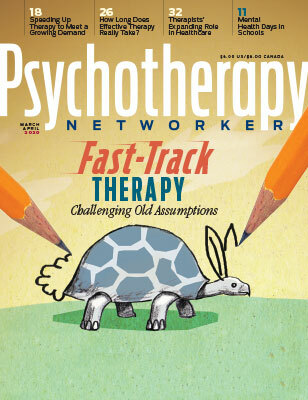 Psychotherapy Networker’s Lauren Dockett speaks with art and expressive art therapist Cathy Malchiodi about the broadening of her field, how talk therapists can incorporate the arts to help clients connect and express, and why her work is so effective in healing trauma. Cathy Malchiodi, PhD, is a psychologist, traumatologist, and expressive arts therapist. Her books include Handbook of Art Therapy, Expressive Therapies, and Art Therapy Sourcebook. She writes the Arts and Health column for Psychology Today Online, with a following of 4.6 million readers. As Malchiodi explains, whether you're using drawing, painting, music, or movement, the arts have been used to heal for thousands of years, allowing us to temporarily move past whatever challenges we may be facing at a particular moment. Read her personal story and case illustration in her article “Kindling the Spark,” from the March/April 2019 issue on embracing a more embodied psychotherapy.